The A7S II is the best video shooting stills camera available at the moment. The resolution is kept to 12 million pixels to allow better light gathering power and improve video quality. It produces video close to that of professional-level dedicated, but is much smaller and lighter and can record 4K footage internally. 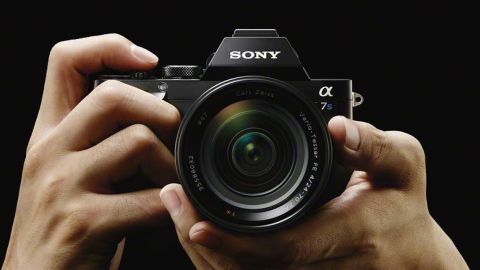 After the introduction of the Sony Alpha 7 II and Sony Alpha 7R II it was only a matter of time before Sony introduced the update to the Alpha 7S, its 12Mp, low light and video-centric model which has become popular in the film and television industry. Sure enough, the Alpha 7S II was announced in September 2015 and is now on sale. While the changes brought by the new camera are welcome, its specification sheet holds few surprises, featuring many of the upgrades already seen elsewhere in the Sony A7 range. The Sony A7S II is optimised for video and low light, with a full frame sensor and relatively low pixel count of 12MP. The A7S II uses Sony's full frame E-mount lenses, but other lenses can be used via adaptors. For example, like the A7R II, the A7S II can record 4K 4:2:0 8-bit video (in XAVC S format and with no pixel binning) to a suitably fast memory card and it has a 5-axis stabilisation system. Pixel binning combines the output from a small grid of pixels and it's a way of getting higher sensitivities from a sensor at the cost of a lower resolution. Like the A7S, the Mark II can also record 4K video to an external recorder like the Atomos Shogun via HDMI with 8-bit 4:2:2 colour depth. Having 8-bit colour means that there are 256 shades of each primary colour, which may sound good but it doesn't compare so well with recording externally to a 4K recorder from a Panasonic GH4 as its 10-bit output gives 1024 shades per colour. One significant first scored by the A7S II for the A7-series, however, is the ability to record full HD footage at up to 120fps at 100Mbps (without pixel binning) for super-slow motion playback. The A7S cameras are also designed for low-light shooting and as before, the maximum sensitivity setting is ISO 409,600. The native range is ISO 100-102,400. There's also the 5-axis image stabilisation system that we've seen and appreciated in the A7 II and A7R II, for smoother footage and sharper images. Like the original A7S, at the heart of the A7S II is a full-frame 12.2Mp Exmor CMOS sensor. According to Sony's Masaaki Oshima, Deputy General Manager of the Digital Imaging Business Group's Imaging Products and Solutions Sector, the new camera uses the same sensor and processing engine as the A7S, but new circuitry along with improved noise reduction algorithms mean that noise is controlled much better than before. It's also been optimised for video recording. External design changes improve the handling of the A7S II over its predecessor. Sony has increased the number of autofocus points available from 25 on the A7S to 169 with the new camera. It also claims a 2x faster AF response in video mode. It still relies on contrast detection autofocus, however, and unlike the A7 II there's no phase detection element. Sony's Picture Profiles are available to allow videographers to tailor the appearance of video (and stills) in-camera. These make it possible to set specific values for Black Level, Gamma and Knee (highlight compression) as well as colour adjustment (Color Mode, Color Level, Color Phase and Color Depth) and Detail. The Gamma settings include Sony's S-Log2 as well as the new S-log3 setting. These can increase dynamic range by up to 1300% by creating very flat looking footage that is ideal for post-capture grading. S-Log2 is designed with highlight preservation in mind while S-Log3 helps capture greater tonal range in shadows and mid-tones. There's also a helpful new Gamma Display Assist option that lets you see the scene with natural contrast even though you're shooting with an S-Log gamma setting. As usual, focus peaking, zebras and a histogram can be made visible to aid focusing and exposure. The only thing really missing from the A7S II compared to Sony's professional large sensor video cameras is built-in neutral density filters. As with other video SLRs/CSCs you will need to add a neutral density filter to your lens so you can use wide apertures for shallow depth of field while keep shutter speed to 1/50sec or longer.